7 Up! slot is a retro-themed fruit slot playing on three reels and three rows. The total 5 selectable paylines enable the players a wide range of betting options, with the starting bet at just one penny. The game seems plain on first appearances, however, there is merit to it. With a top cash prize of 3885x multiplied by the line bet, 7 Up! 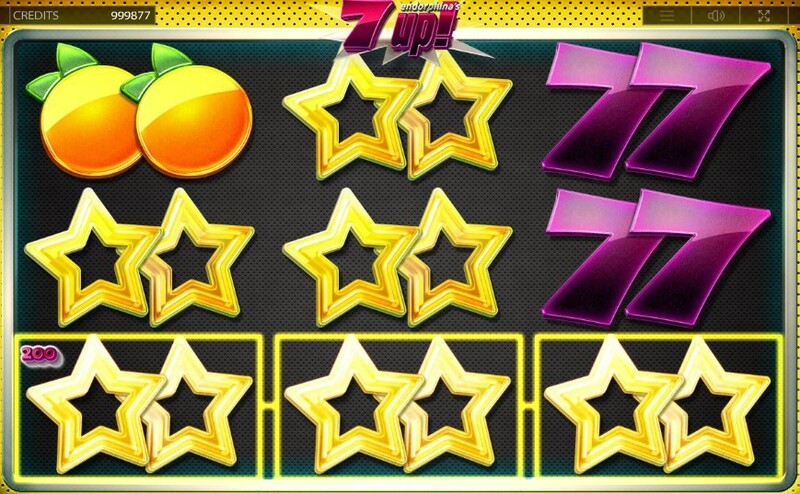 slot has the sevens as the most lucrative symbol with the double stars following with a worth of pay of 1000x. If you are up for a retro challenge on the 7 Up slots game, you are welcome to play for a chance at winning the 777x prize. If you manage to fill an entire grid with nine 77 symbols, the prize gets even bigger. A simple slot game could go a long way in entertainment value and gameplay, but that just doesn't happen to all retro slots. Here we have the 7 UP slot game featuring a number of fruit symbols that play on a simple reel-set of three reels and three rows. The 7 UP game excels at providing a very basic gameplay that somehow the developers have managed to make quite entertaining. 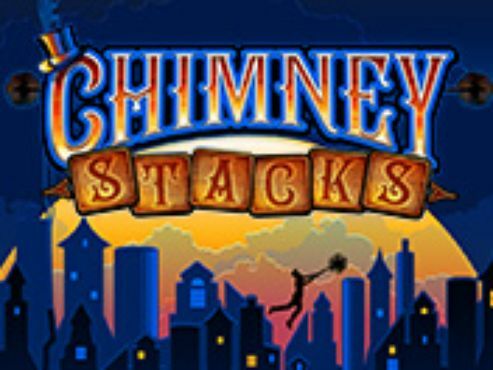 It looks like the game has withstood the test of time and is still available at a number of solid online casinos. The game has a total of five paylines and that seems like it is enough, considering the retro style, look and feel of the game. The producers behind 7 UP are Endorphina, which have significant experience in making slots, having released dozens of games. So when considering if you want to call this one your favorite game for some time, do give it a chance and play it for few turns. You will see that there is something enchanting about the game that you will find enjoyable. Besides all that, 7 UP comes with 7x multipliers and a top payout prize of 777 multiplied by the line bet - hence the title of the game. Here is a thing that we find unique about this game, and when we give it that epitet we don't quite mean that it is unique in an exceptional way. In setting up the game's wager per spin, you have to look for the values to set in two places. The first place is in the top left corner of the reel-set, where you will see the amount of the coin size. Clicking on the number will make it increase until if flips over and comes back to the basic value of 0.01. The highest coin size that you can play, which multiplies with the number of active paylines and the bet level, is £1.00. Now, why is this setting in the top left corner of the page, instead of at the bottom with all of the other settings, we couldn't possibly know. But, it's there and it is a small nuisance. As for the Bet setting, it stands for Bet Level, and it is the setting that multiplies the selected coin size with the number of selected paylines. There is a total of ten levels, which can produce the highest bet of £50 per spin. The smallest bet per spin is with the coin size of £0.01 and on one active payline and on the first bet level, the total wager will be the same - £0.01. However, 7 Up slots offers many wager amounts in-between the two extremes. The slot design reflects one of the best retro slots ever made. You will notice that the fruits and the other classical slots symbols apper as if they are made of jelly. The designers have really invested some thinking and talents in producing that effect, and there is good that has come out of it. The 7 Up slot is a known game, and many players enjoy this compared to retro-themed games that have been produced by some known production studious. 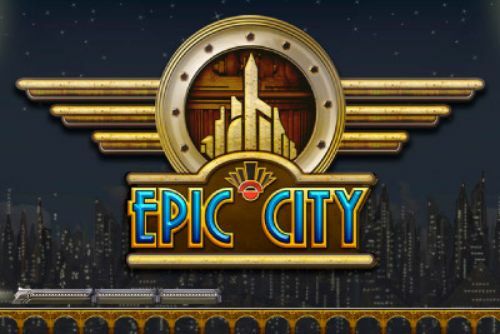 At any rate, the symbols are all too familiar for anyone not to recognize that this is a classical, retro slots game. You will see lots of reel action involving cherries, lemons, watermelons, raspberries, blackberries and oranges. All of these fruits come in doubles - that's how the symbols have been made simply. In addition to these, there are the high-valued symbols represented by BAR, the purple double lucky seven symbol and the double stars. You won't find any wild symbols, but the game does have a bonus that is triggered when one of the fruits covers the entire reel-set. 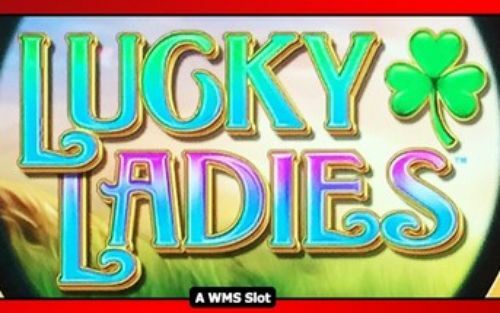 Winning this and any other slots game is a matter of luck, but here we have some exceptional pays that can occur with just three symbols chancing on the reels as part of a selected payline. The game's most valuable symbol and the purple lucky double seven. In the event of three such symbols filling a payline, the player gets to cash in on a prize of 777x on the line bet. The second most valuable symbol are the double starts. Seeing three of these appear on one of the active paylines will result in a prize of 200. The next over is the Bar symbol. Seeing three on a payline results in a prize of 77. It isn't a coincidence that the number 7 appears so many times on the paytable - hence the game is called 7 Up slot. Last but not least, there is the bonus feature which occurs when a single symbol fills the entire grid. That is nine matching symbols falling on the entire three reels and three rows. 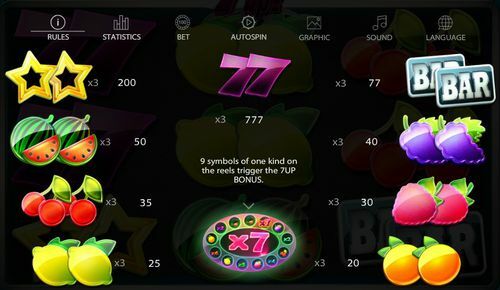 In the event, 7 Up delivers a multiplier of x7 which will multiply the cash prize that has been gotten from that single fruit symbol filling the entire reel-set. 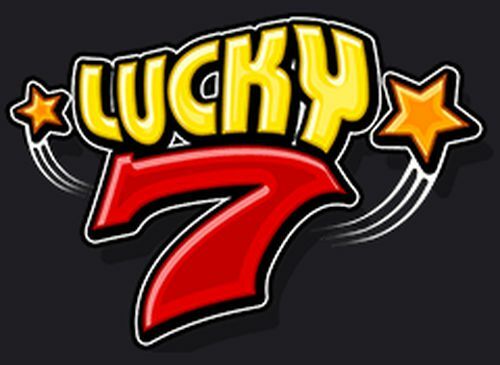 Now imagine the 777 cash prize 77 symbol does that - in the event, you'll be looking at a nifty jackpot win. 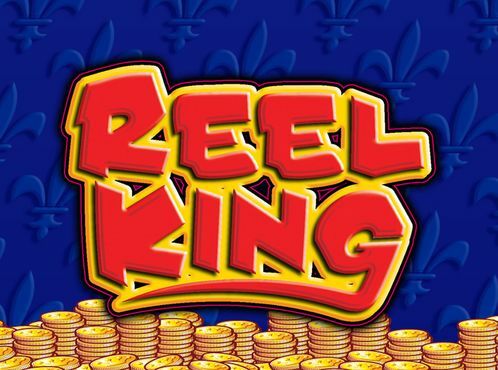 You are welcome to start your retro slots adventure by claiming a welcome bonus at one of the casinos on this page.